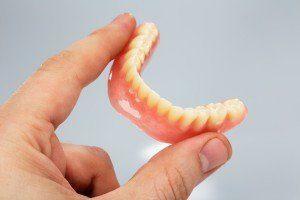 Dentures: Complete, Partial, or Mini | Grand Dental P.C. Dentures are appliances that replace missing teeth, that can either be removable (you can take them off) or fixed (only the dentist can remove them), and partial or complete. Partial dentures are used if you have some remaining teeth left, while complete dentures are used if all of your teeth are missing. Dentures are a popular teeth replacement option because they’re affordable, convenient and effective. Modern versions feel and function just like natural teeth, and look incredibly realistic—only your dentist can tell that they’re artificial! Dentures also improve your appearance and prevent the “sunken-in” look. Grand Dental, P.C. takes great care to listen to and see to your preferences when creating your dentures. You can be assured that we will strive to make them as comfortable as possible to wear, and natural looking as well. Each set of dentures—partial or complete—is custom-made to suit the fit and preferences of its wearer, taking up to several appointments to create the perfect set. To create the dentures, a mock set is first created based on the measurements from the patient’s oral impressions. Upon the first fitting, the dentist then takes note of the patient’s specific preferences in fit, color, and shape for any final adjustments. Once a denture design is agreed upon, a final set is casted. Even when a denture has been produced, it can still be adjusted further for a better fit. Partial dentures fill gaps left by one or more missing teeth, as well as prevent your remaining teeth from moving out of position and causing bite problems. Complete dentures can be conventional or immediate. The dentist waits for the gums to heal after tooth extraction before placing conventional dentures. On the other hand, immediate dentures are made in advance and placed right after your teeth are extracted. Adjustments are made once your gums heal. Dental implants are titanium posts that serve as replacement tooth roots. Your jawbone must be thick and tall enough to support the implants. For patients with excessive bone loss and those who don’t want or unable to get bone grafts, mini implants are the perfect solution. They’re about half the size of regular implants, so they can be placed even in areas of thin bone. Dentures supported by implants are the ultimate in comfort and convenience. No more slipping or sliding because the dentures are anchored securely by titanium screws. If you have lost one, several or all of your teeth, or you want to chew and speak normally again, dentures and implant dentures are the perfect solutions. You can rely on our services to help you with whatever dental issues you might have. Contact your Grand Junction, CO dentist today to find out what we can do for you!